The Dogon and Shannon Dorey are on Facebook. The Dogon spoke of alien water beings known as Nummo who came from the stars. According to the Dogon, these immortal and amphibious beings were responsible for human creation through genetic engineering. 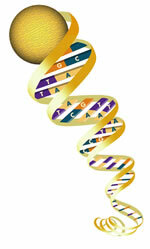 The Dogon referred to a failed biological experiment that caused humans to lose their immortality. This failed experiment resulted in the creation of a male being known as the Jackal, who was considered the first mortal human. He was responsible for a devastation on the Earth that resulted in the Nummo leaving the Earth and heading to the Pleiades star system. It wasn't until many years later that the Eight Nummo Ancestors returned to Earth from the Pleiades to help those humans who has survived the initial firey devastation caused by the Jackal. In Dogon mythology, it was the DNA of "the Master (Mistress) of Speech", also known as the Seventh Ancestor, that was supposed to provide hope for humanity and correct the mistakes made from the first failed biological experiment. Dorey's research reveals that this androgynous pagan saviour was eventually transformed by patriarchal cultures into various male saviours including the Christ figure of Christianity. Dorey's careful analysis of this mythology indicates that this figure was an androgynous being who was identified with the sacred feminine, which is why Dorey refers to her as the Mistress of Speech. 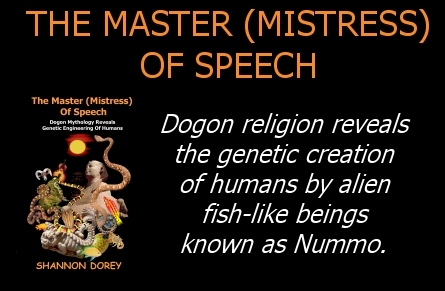 In The Master (Mistress) of Speech Dorey associates the Dogon religion with paganism, Christianity, Judaism, and the Greek and Egyptian mythologies. Her research reveals a connection to the Zodiac and refers to the destruction of the Earth as told in Plato's Timaeus relating to Atlantis. She refers to the human unconscious and our relationship to time and immortality. The information presented in The Master (Mistress) Of Speech will be disturbing for some individuals. The facts however speak for themselves. This is a must read for anyone wanting to come to terms with the truth about the beginning of human existence. Buy a copy of The Master (Mistress) Of Speech.